1.The total procedure is explained to the patient to make him /her comfortable and relaxed. 2.The patient sitting and leaning forward position with arms folded before him/her and kept over a cardiac table. 4.The local part is prepared under strict aseptic condition. 5.The site of aspiration is infiltrated from the skin up to parietal pleura through subcutaneous tissue with 2 % lignocaine solution. 6.The pleural aspiration needle is inserted right angle to the skin, just above the upper border of the lower rib (to avoid injury to vessels and nerves). 7.The needle is then attached to a three-way cannula, and the cannula is in turn connected to a 50 mL syringe. 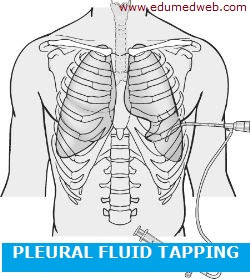 8.Application of suction in the syringe draws pleural fluid into the syringe which is pushed into a kidney-tray via the outlet of the three-way cannula by adjusting its screw. 10.The puncture site is sealed with tincture benzoin when the paracentesis is over. 11.The patient should be monitored for next 24-48 hours for development of any complication.